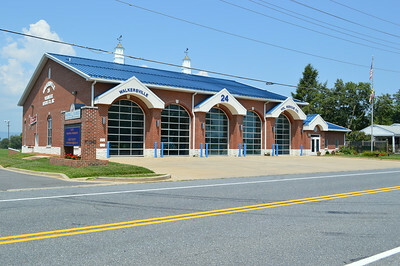 Walkersville Rescue Company - Frederick County Station 24. Rescue 24 is rather large - a 2001 Pierce Quantum, sn- 12290 that was rehabbed in 2014 by Atlantic. Note the double roto-rays and train horn on the bumper. 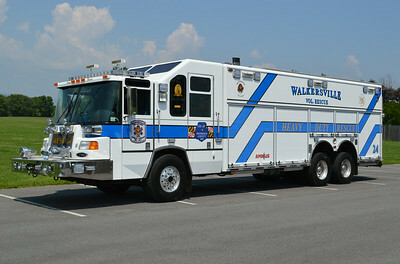 Close up of the Walkersville heavy rescue. 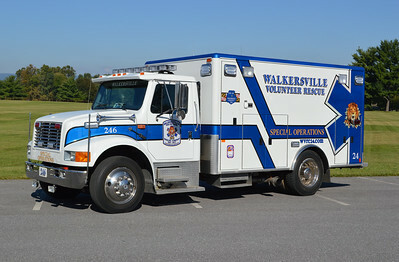 Walkersville Rescue Squad "246", a 1995 International 4700/Horton that was modified in 2015 by both the rescue squad members and PL Custom to operate as a Bariatric Unit (heavy/large patients). 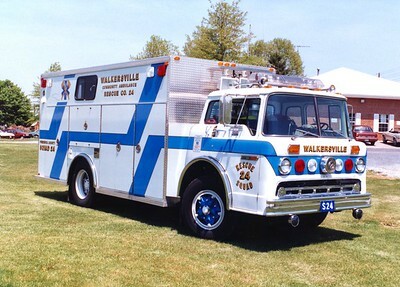 It was originally Ambulance 248 for Walkersville VRS. 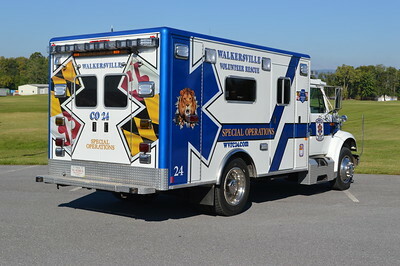 Walkersville's "Special Operations" unit is Ambulance 246. It is a 1995 International N4700/Horton that previously ran as Ambulance 248. In 2015, the department decided that instead of retiring the ambulance, they would convert it to a bariatric unit, used to transport obese patients. It is used throughout Frederick County when such a need arises. 2015 work on the ambulance included extensive work by department members, PL Custom modified some of the interior as well as miscellaneous work (i.e. 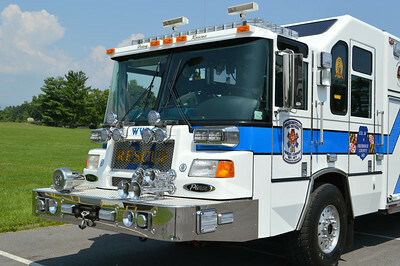 addition of a winch), and a new paint job was provided by Damascus Motors and lettering/graphics by Shannon-Baum Signs. 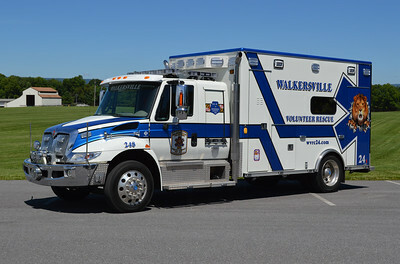 Back end view of the unique graphics on Walkersville VRS "246". 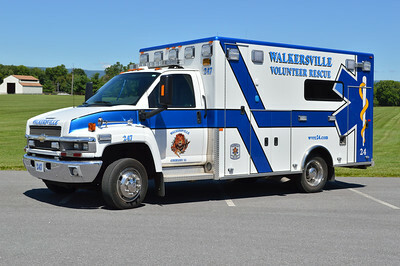 One of two similar units, Ambulance 247 is a 2009 Chevrolet C4500/PL Custom. Several nice ambulances in service at station 24. Ambulance 248 is a 2013 International 4300 4x2/2014 Road Rescue. 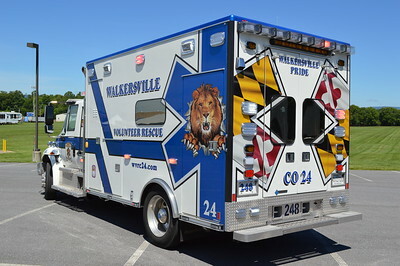 Rear view of Walkersville, Maryland's Medic 248. 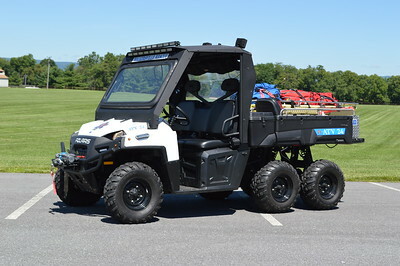 Last from Walkersville Rescue is ATV 24, a 2012 Polaris 6x6. 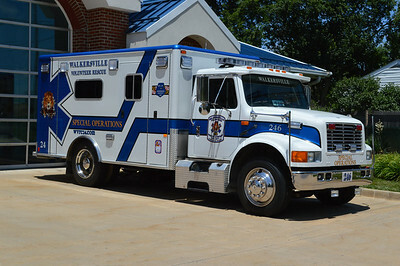 Former Rescue 24 from Walkersville Rescue, a 1983 Ford C/EVF. 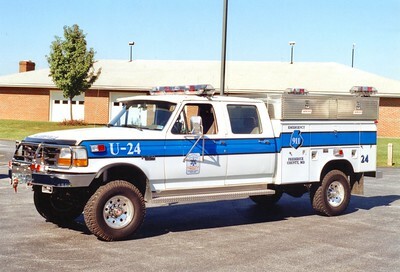 Former Utility 24 from Walkersville Rescue, 1994 Ford F-350/Reading.